Andrea Fotopoulos has been practicing asana since 1996 and teaching since 2004. 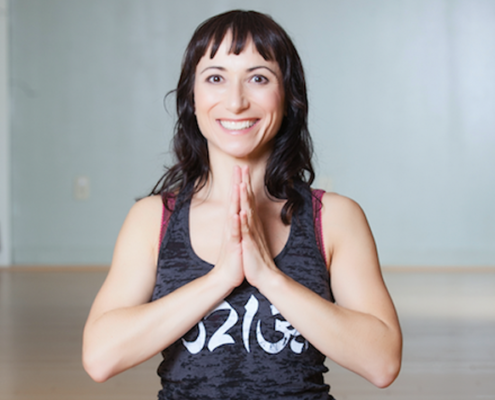 Known for her skill, clarity and authenticity, Andrea’s teaching style is a blend of functional alignment, dynamic movement and inspiration that creates a bridge between the hard work on the mat and off. With a mix of no-nonsense direction and some good ol’ humor, she creates space for each student to do their individual work, while also cultivating a strong sense of community to practice within. Andrea ​is dedicated to making yoga accessible for everybody by making the difficult doable and the doable difficult. Both her personal practice and her teaching style are heavily shaped by the Anusara yoga methodology, Tantric yoga philosophy and her ongoing studies with her highly skilled and deeply inspiring teachers: Christina Sell, Desiree Rumbaugh, Darren Rhodes, Noah Maze, Douglas Brooks and all of their teachers and their teachers’ teachers. Andrea is proud to be from Boston, where she lives with her daughter & partner, their cat Mew. She is fortunate to have her spunky mom nearby and her sister and nieces and nephews in the area. Her full teaching schedule can be found on ​www.andreafotopoulos.com​. You can also follow her on FB & Instagram.